THE SKY I SCRAPE: Mystery Vinyl Sale! Is that a blue Fixer? Oh yeah, yeah it is. And you've got a chance ... a small chance ... of landing one. Maybe also a Lightning Bolt Sevens box, a Benaroya boxed set, a color PJ20 set, and lots of other rare and exciting vinyl items. 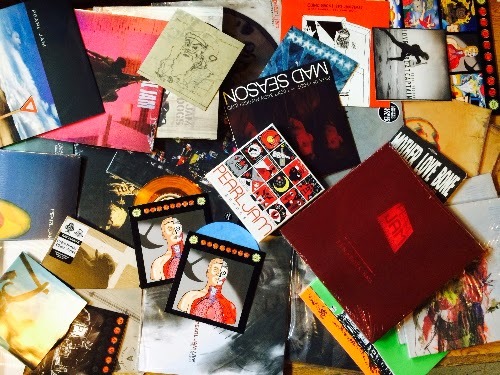 Pearl Jam is celebrating Record Store Day at 10am EDT with a Mystery Vinyl Sale. For $50 +S&H, you get one 12" item and one 7" or 10" item from the list below. Amounts are also listed, so start calculating your chances! Crowdfunded Pearl Jam Show "Unlikely to Happen"
Pearl Jam March Madness: DO THE EVOLUTION Wins!